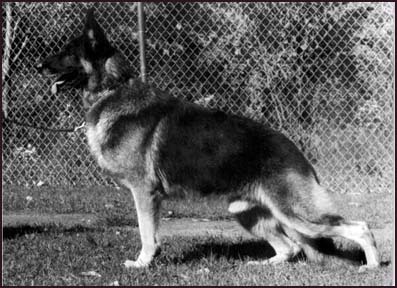 "A large masculine black and tan amle of good proportions and excellent type. He had a very high wither, a short strong back and a croup of porper angle and length. Upperarm length is long but the angle could be better. Hindquarter angulation is excellent. Long bones are straight. Dentition is strong. The dog is clean in sidegait and has a balanced, powerful masculine sidegait." Best of Breed was a large impressive stallion-type male, Ch. Sukee's Mannix. He was clean coming and going and had a beautiful, balanced period of suspension plus the true "Look of Eagles". "This dog took my eye from the very beginning. A big masculine stallion-type, with dark pigmentation of black and tan with a heavy lush coat. Tremendous reach with excellent layback of shoulder. Strong sweeping rear angulation with powerful drive. Good back, high withers, good topline. Sound coming and going. Deep bodied, good bone, good spring of ribs, a beautiful side mover. The head is large, rugged, and masculine. If I had to change anything about the dog, it would be the head, with a little more stop and not such a high bridge on the nose. The whole dog gives the impression of nobility and power - worthy of Grand Victor title."